These trees on both sides of Third Avenue are among those that will be removed. 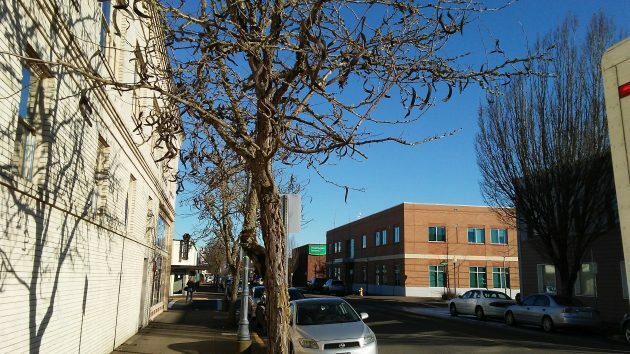 City Hall announced this week that starting Wednesday, Jan. 11, about 130 street trees downtown will fall to the chainsaw in an operation that’s supposed to be finished by the end of February. City Engineer Staci Belcastro told me Friday that Buena Vista Arbor Care submitted the lowest of three quotes at $99,115 and would be awarded the contract. The trees about to bite the dust line the sidewalks on Second Avenue between Washington and Lyon streets, Third between Ferry and Lyon, Broadalbin Street between Second and Third, and Ellsworth and Lyon streets from First to Eighth.. The tree cutting is an early phase of the streetscape improvement program for which the Central Albany Revitalization Area committed $8.4 million. It’s a project to rebuild and decorate selected downtown streets and sidewalks. The work is to be launched this spring and be completed by the fall. Why cut the trees now, in winter? To avoid analogue possibly violating the Migratory Bird Treaty Act of 1918 as amended. That federal law, I was astonished to learn, makes it illegal to harm virtually any bird or its nest. There are more than 450 species of migratory birds in Oregon, and more than 300 of them breed in the state too. The nesting season is from about March 1 to Aug. 31. So, rather than run the risk of finding a nest in a downtown street tree and possibly having to delay the entire project for a year in order to do studies and get federal permits to “take” a migratory bird, city officials decided to do the logging starting now and finish before the nesting season starts. That way, if they do find a nest, it’s going to be unoccupied, and there’s no complication with the Feds. The inner city clear cut aptly described by Mr. Hering presents a unique opportunity for inter-governmental cooperation. The City is soon to have a small surplus of timber for which it has no use. Linn County has, by it’s own estimation, been consistently shorted by State and Federal forestry regulations, depriving Linn County residents of their so-called timber dollars. The folks who want clear cutting to pay their way through life have been angry ever since the Marbled Murrelet was thought doomed. If the City Mothers and Fathers can figure a workaround for the several hundred regulations written to prevent such a thing, perhaps the city clear cut could be transferred to Linn County. In turn, the Commission could sell the timber, gaining some small relief. The proceeds could be used to fund the ongoing lawsuit the County has going. This would represent an unprecedented level of intergovernmental cooperation which will be made all the more important as our new Putin-Installed administration takes the reins in Washington DC. Your inane comments are the mark of a true liberal. It strikes me that since the conservatives your comments appear to support recently elected a Real Estate salesman to the presidency, a person who lies to the American people on a daily basis, that you ought to be less concerned with what Liberals are thinking and more concerned about the man Putin put into the White House. Just sayin. A wise Conservative ought be more worried about the Putin-puppet, Trump, who has been installed in Washington DC. With Trump’s presidency already illegitimate, Conservatives ought worry about things far more important than a few clear-cut trees downtown. We Liberals are, for the time being, mere back-benchers with little power or control. The pendulum will invariably swing back our way once Trump and his clownish cabinet muck things up. But for now, we must concern ourselves with smaller matters. But, I thank you for your concern. …or out the other end. And, I for one, kinda like it. Carry on, please. One thing I can do is bring out the liberals. A lying president after Obama. You must not have ever heard him. And if Wikileaks’s is a Russian plant why isn’t Julian in a Russian embassy. You still have that doctor Obama said you could keep. And how about those deductibles-Obama sure improved the health system. Ha ha….taking credit in a comment section. Well done sir! Even those with short term memory loss can acknowledge what an amazing “J O B” Pres. Obama did pulling us back from GREAT DEPRESSION II. Yes…from ground work laid by republicons. That Obamacare….also a republicon plan. double ha ha.